Donations. Have a Silent Auction coming up or another community event that could use Vie’s help? We are here for you! Please direct all donation requests to lynsie@getvie.com. We love donating plans and cooking classes to our community for help with fundraising for local schools and organizations. Work with us. 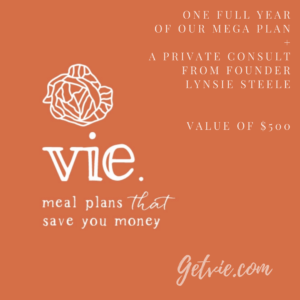 Vie also loves collaborating with local like-minded businesses and non-profits to promote health through food in the communities we represent. Get in touch if you want to work with us!